As Indian manufacturing was systematically crushed - in favour of British industry - and the country looted, pomp and pageantry was employed to create an aura of awesome imperial majesty to silence seditious subjects. The following is the preface from 'An Era of Darkness - The British Empire in India', by Shashi Tharoor. 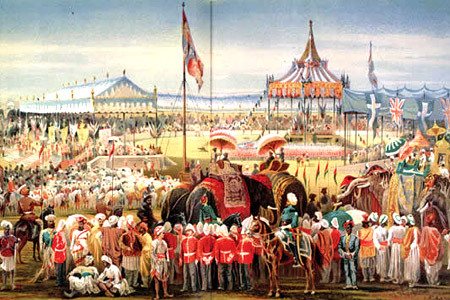 The Delhi Durbar of 1877 was held on a cold January morning in Coronation Park to proclaim Queen Victoria the Empress of India. Subsequent durbars were held in 1903 and 1911 (the last for the coronation of King George V who visited India with Queen Mary. An Oxford Union debate sowed the seeds for 'An Era of Darkness - The British Empire in India' - a sweepingly erudite yet thoroughly entertaining, enlightening, and readable book, by Indian politician and writer Shashi Tharoor. Tharoor cuts through jargon, dog-eared history tomes and confounding chronology, to get to the heart of key issues, not in the dreary linear fashion favoured by historians, but with neat bundles of robust interconnected essays tinged equally with wisdom and wit. He examines India's experience under the yoke of Empire as Britain's economic fortunes grew and India sank under the onslaught of institutionalized plunder. This is the full preface of the book (reprinted with the permission of the author) published by the Aleph Book Company. Also available on Snapdeal. The British edition, 'Inglorious Empire- What the British did to India' by Hurst is out March. THIS book, somewhat unusually, began as a speech. At the end of May 2015, I was invited by the Oxford Union to speak on the proposition ‘Britain Owes Reparations to Her Former Colonies’. Since I was already scheduled to speak at the Hay Festival of Literature in Wales later that week, I thought it might be pleasant to stop in Oxford on the way and debate there again (as I had once done, on behalf of the United Nations, a decade earlier). The event, in the Union’s impressive wood-panelled premises dating back several centuries, was a success and I left pleased enough, but without giving the proceedings a second thought. In early July, however, the Union posted the debate on the web, and sent me a video copy of my own speech. I promptly tweeted a link to it—and watched in astonishment as it went viral. Within hours it was being downloaded and replicated on hundreds of sites, sent out on WhatsApp and forwarded by email. One site swiftly crossed over three million views; others did not keep track, but reported record numbers of hits. Right-wing critics of mine suspended their ‘trolling’ of me on social media to hail my speech. The Speaker of the Lok Sabha went out of her way to laud me at a function attended by the Prime Minister, who then, in his own remarks, congratulated me for having said ‘the right things at the right place’. Schools and colleges played the speech to their students; one university, the Central University of Jammu, organized a day-long seminar at which eminent scholars addressed specific points I had raised. Hundreds of articles were written, for and against what I had said. For months, I kept meeting strangers who came up to me in public places to praise my ‘Oxford speech’. I was pleasantly surprised but also a bit perplexed. For one thing, though I had spoken well enough for my side to win the debate by a two-thirds majority of the audience, I knew I had made better speeches that had not acquired a tenth of the fan following this one had. For another, I honestly did not think I had said anything terribly new. My analysis of the iniquities of British colonialism was based on what I had read and studied since my childhood, and I thought the arguments I was making were so basic that they constituted what Americans would call ‘Indian Nationalism 101’—the fundamental, foundational arguments that justified the Indian struggle for freedom. Similar things had been said by the likes of Romesh Chunder Dutt and Dadabhai Naoroji in the late nineteenth century, and by Jawaharlal Nehru and a host of others in the twentieth. Yet the fact that my speech struck such a chord with so many listeners suggested that what I considered basic was unfamiliar to many, perhaps most, educated Indians. They reacted as if I had opened their eyes, instead of merely reiterating what they had already known. It was this realization that prompted my friend and publisher, David Davidar, to insist I convert my speech into a short book—something that could be read and digested by the layman but also be a valuable source of reference to students and others looking for the basic facts about India’s experience with British colonialism. The moral urgency of explaining to today’s Indians—and Britons—why colonialism was the horror it turned out to be could not be put aside. There is a third respect in which this book differs from my speech. At Oxford I was arguing one side of a debate; there was little room for nuance or acknowledgement of counter-arguments. In a book laying out the evils of Empire, however, I feel duty-bound to take into account the arguments for the British Raj as well. This I have done in each chapter, especially in Chapter 2, and in chapters 3 to 7 in which I consider and reject most. *As I was typing this last sentence, somewhat hastily, my computer’s spellcheck offered ‘Brutish’ as an acceptable substitute for ‘British’ rule in India! Of the well-worn remaining arguments in favour of the British empire in India. I have supplemented my own years of reading with extensive research both into colonial-era texts and into more recent scholarly work on the British in India, all duly cited in the notes at the end. I hope my arguments have sufficient expert backing, therefore, to be regarded seriously even by those who may disagree with me. Finally, this book makes an argument; it does not tell a story. Readers looking for a chronological narrative account of the rise and fall of the British empire in India will not find it here; the sequence of events is outlined only in the chronology preceding this Preface. The purpose of this volume is to examine the legacy of the Raj, to critically study the claims made for its alleged benefits, and to present the evidence and the arguments against it. My speech did not, of course, arouse universal approbation. For one thing, in the context of the debate I could scarcely acknowledge that many aspects of Empire were far more complicated in nature or ambiguous in impact than any generalization of good or evil could do sufficient justice to. This book is built on the premise that many of the issues involved require more complex treatment and substantiation than is possible in a debate speech. In addition, several other arguments were made in response to my speech that should be acknowledged here, even though they do not fit directly into the themes of any of my chapters. The most common of these criticisms is that India’s postcolonial failings invalidate my attacks on Britain’s colonial cruelties. ‘Tharoor might have won the debate—but moral victory eludes India’ wrote Shikha Dalmia in Time, arguing that the Indian government’s performance after Independence indicates that there is no evidence that any reparations paid to India would be spent well, or would reach the intended beneficiaries. One blogger added, for good measure, that the deplorable attitude of India’s post-Independence authorities is evident from over 10,000 lakh tonnes of food grains that were found damaged in the Food Corporation of India’s depots in 2010, as if incompetence after Independence justified the famines before it. Some of these criticisms are legitimate—indeed, I have made variants of them myself in my own books, though not in such extreme or trenchant terms—but one set of failings do not invalidate another. Nor can twenty decades of colonial oppression be undone in six; the record of Indian, indeed Congress, governments is in most respects vastly better than that of their British colonial predecessors in India, especially on such indices as GDP growth, literacy, poverty eradication, life expectancy and overcoming droughts and crop failures. History, in any case, cannot be reduced to some sort of game of comparing misdeeds in different eras; each period must be judged in itself and for its own successes and transgressions. The fact that reparations were a centrepiece of the Oxford debate added fuel to my critics’ fire. One Indian commentator argued that the claim for reparation revealed India’s insecurities and low self-esteem; Indians making this argument were transferring responsibility to the British for the subsequent failures of Indian rule. Others pointed out that it would be impossible to identify the beneficiaries who genuinely deserved to receive compensation for colonial exactions. In any case, some averred, Britain has in effect provided reparations in the form of aid to India over the years—not, by any means, as acceptance of guilt, but out of British generosity to their former colonial subjects. More than enough has been unilaterally transferred from Britain to India post-independence, and not just as aid; according to historian John MacKenzie, one of my adversaries at Oxford, British companies ‘can be said to have fostered part of the outsourcing boom that India experienced which can be considered a form of reparations’. Another debater against the Oxford motion, Sir Richard Ottaway, MP, argued that given the voluntary aid extended by wealthier countries to poorer ones, ‘to demand even more is to maintain the old inferiority complex’. I need scarcely point out, of course, that I did not demand more; I demanded less—just a symbolic one pound a year. But that is also beside the point. I used Oxford’s reparations motion to raise the issue of the moral debt Britain owed her former colonies, not a financial one. And as for aid, British aid amounts to less than 0.02 per cent of India’s GDP, and somewhat less than the Government of India spends on fertilizer subsidies—an appropriate metaphor, perhaps, for the aid argument. Many pointed out that today’s Britons bore no responsibility for the transgressions of their forebears and should not be expected to bear the burden of reparations for sins in which they played no part. Nor, for that matter, were today’s Indians worthy of being compensated for the sufferings of their ancestors. Compensation should be paid to the victims, not to their grandchildren, and by the wrongdoers, not by their grandchildren. Fair enough, but this elides the sense of national identity and responsibility that characterizes most countries. When Willy Brandt was chancellor of Germany, he sank to his knees at the Warsaw Ghetto in 1970 to apologize to Polish Jews for the Holocaust. There were hardly any Jews left in Poland, and Brandt, who as a socialist was persecuted by the Nazis, was completely innocent of the crimes for which he was apologizing. But in doing so—with his historic ‘Kniefall von Warschau’ (Warsaw Genuflection), he was recognizing the moral responsibility of the German people, whom he led as chancellor. That is precisely why I called for atonement rather than financial aid. Of course, not everyone agrees that even atonement is due. Historian John Keay put it best: ‘The conduct of states, as of individuals, can only be assessed by the standards of their age, not by today’s litigious criteria. Otherwise, we’d all be down on the government of Italy for feeding Christians to the lions.’ Amusing, but indefensible. The British Raj is scarcely ancient history. It is part of the memories of people still alive. According to a recent UN Population Division report the number of Indians over the age of eighty is six million: British rule was an inescapable part of their childhoods. If you add to their number, their first-generation descendants, Indians in their fifties and sixties, whose parents would have told them stories about their experiences of the Raj, the numbers with an intimate knowledge of the period would swell to over 100 million Indians. It is getting late for atonement, but not too late: I, for one, dearly hope that a British prime minister will find the heart, and the spirit, to get on his or her knees at Jallianwala Bagh in 2019 and beg forgiveness from Indians in the name of his or her people for the unforgivable massacre that was perpetrated at that site a century earlier. David Cameron’s rather mealy-mouthed description of the massacre in 2013 as a ‘deeply shameful event’ does not, in my view, constitute an apology. Nor does the ceremonial visit to the site in 1997 by Queen Elizabeth and the Duke of Edinburgh, who merely left their signatures in the visitors’ book, without even a redeeming comment. Whoever the PM is on the centenary of that awful crime will not have been alive when the atrocity was committed, and certainly no British government of 2019 bears a shred of responsibility for that tragedy, but as a symbol of the nation that once allowed it to happen, the PM could atone for the past sins of his or her nation. That is what Prime Minister Justin Trudeau did in 2016 when he apologized on behalf of Canada for the actions of his country’s authorities a century earlier in denying permission for the Indian immigrants on the Komagata Maru to land in Vancouver, thereby sending many of them to their deaths. Trudeau’s Willy Brandt moment needs to find its British echo. Indeed, the best form of atonement by the British might be, as Labour leader Jeremy Corbyn has suggested, to start teaching unromanticized colonial history in British schools. The British public is woefully ignorant of the realities of the British empire, and what it meant to its subject peoples. These days there appears to be a return in England to yearning for the Raj: the success of the television series Indian Summers, building upon earlier Anglo-nostalgic productions like The Far Pavilions and The Jewel in the Crown, epitomize what the British-domiciled Dutch writer Ian Buruma saw as an attempt to remind the English ‘of their collective dreams of Englishness, so glorious, so poignant, so bittersweet in the resentful seediness of contemporary little England.’ If British schoolchildren can learn how those dreams of the English turned out to be nightmares for their subject peoples, true atonement—of the purely moral kind, involving a serious consideration of historical responsibility rather than mere admission of guilt—might be achieved. Britain is no longer ‘Thatcherite’, though in the aftermath of ‘Brexit’, it may even be worse. The need to temper British imperial nostalgia with postcolonial responsibility has never been greater. And then there’s the issue of Indian complicity in British rule. The Indian columnist Aakar Patel suggested that we are unable to come to terms with the fact that the British ‘takeover was facilitated and encouraged by Indians’. Indeed, Indians were active collaborators in many, if not most, of the misdeeds that I will spell out in this book. This was especially true of Indian princes who, once British rule was well established, accepted a Faustian bargain to protect their wealth and their comforts in exchange for mortgaging their integrity to the British. These nominal ‘rulers’ went out of their way to demonstrate their loyalty to the Crown—thus the cricketer-prince Ranjitsinhji obliged his peasantry, in the midst of a crippling drought, to contribute to the British coffers during World War I; and as his state choked in the grip of famine, he literally burned up a month’s revenues in a fireworks display for a visiting viceroy. Such episodes were by no means untypical of the complicity shown by the compromised Indian aristocracy with the colonial project. There were other well-known Indian supporters of Empire, most notably the Bengali intellectual and unabashed Anglophile, Nirad C. Chaudhuri, who in a series of books extolled the virtues of the British empire and lamented its passing. (We will discuss specific examples later in this book.) Many ordinary Indians, too, went along with the British; many never felt they had a choice in the matter. But when a marauder destroys your house and takes away your cash and jewellery, his responsibility for his actions far exceeds that of the servant who opened the door to him, whether out of fear, cupidity or because he simply didn’t know any better. to the future, but it does partly help explain the present. One cannot, as I have written elsewhere, take revenge upon history; history is its own revenge. One final caveat about this book. I write of British rule in India, fully conscious of the fact that the ‘India’ I am referring to no longer exists but has become three separate states. Much of what I have to say also applies to what are today the independent states of Bangladesh and Pakistan. This is not to associate any unwilling foreigners with my arguments, but to grant that my case is theirs too, should they wish to adopt it. Still, I write as an Indian of 2016 about the India of two centuries ago and less, animated by a sense of belonging morally and geographically to the land that was once so tragically oppressed by the Raj. India is my country, and in that sense my outrage is personal. But I seek nothing from history—only an account of itself. This book has no pretensions to infallibility, let alone to omniscience. There may well be facts of which I am unaware that undermine or discredit some of my arguments. Still, the volume before you conveys in essence what I understand of my country’s recent past. As India approaches the seventieth anniversary of its independence from the British empire, it is worthwhile for us to examine what brought us to our new departure point in 1947 and the legacy that has helped shape the India we have been seeking to rebuild. That, to me, is this book’s principal reason for existence. ‘[W]hen we kill people,’ a British sea-captain says in the Indian novelist Amitav Ghosh’s Sea of Poppies, ‘we feel compelled to pretend that it is for some higher cause. It is this pretence of virtue, I promise you, that will never be forgiven by history.’ I cannot presume to write on behalf of history, but as an Indian, I find it far easier to forgive than to forget. I agree with everything as set out above. Yes, we always hear, the British gave us railroads, the post office and democracy. But, as Tharoor rightly narrates, independence was a pyrrhic victory. The vault had already been looted and caste and religious divides entrenched, especially in Indian politics. An excellent read and certainly a must for any colonial apologist! I enjoyed re-reading this preface of Shashi Tharoor's 'An Era of Darkness'. I recently bought the book. As an academic I have to agree that this is a profound yet necessary departure from established curricula. Conventional wisdom would have it that imperial rule elevated its subjects and conferred vast benefits upon them. Not true. I would recommend everyone - not just Indophiles and Imperial apologists - to read this breezy, engaging, and well-researched book.